In my recent post on lunches, I mentioned risotto, with the promise for a recipe soon. I had to look back through my archives to make sure I hadn’t already shared the recipe here. Turns out, this was NOT the first time I mentioned my risotto method — the previous instance occurred over two years ago, in December 2010. At that time, I also said I would post the recipe, yet a search of my archives shows zero risotto recipes. Let’s call it pregnancy brain, shall we? If you’ve been waiting over two years for my top-secret-easy-and-healthy risotto recipe, I do apologize. If you’ve only been waiting since last week, think how good you have it! The secret to my risotto is using oat groats instead of the traditional arborio rice. Though they sound like something a horse (or a goat?) might eat, oat groats are simply the whole oat grain — what they steam and flatten to make rolled oats. It looks like a wheat berry. So, why use oat groats? Well, nutritionally, you get the health benefits of whole grain oats, with a good serving of heart-healthy fiber. While this is not a fat-free, or even necessarily a low-fat recipe, the natural creaminess of the starch in oats produces an effect similar to arborio rice, and you can have a very rich tasting dish without having to add too much fat. While oat groats take just as long, if not longer, to cook than arborio rice, they require less babying. Traditional risotto has you standing at the stove stirring the whole time, gradually adding small amounts of hot broth every now and then. With oat groats, after toasting the grain for a few minutes, you can toss in the broth, bring it to a simmer, cover it, and walk away. Sure, you’ll have to come back every now and then to give it a stir, but it’s not a big deal. Melt butter over low heat in large sauce pan. Add leeks, and cook gently until softened, 10-15 minutes. Add olive oil and 1/2 t. sea salt. Add oat groats, increase heat to medium, and cook for 5 minutes to lightly toast the grain. Add 3c. broth and the saffron — broth can be hot or cold, but if you start from hot, it will speed things up a bit. Bring to a boil, then reduce heat to maintain a gentle simmer while covered (the oat groats will need to simmer for a total of 60-90 minutes). After 20 minutes, add the butternut squash. You want it to dissolve into the risotto, adding to the depth and richness of the dish. At this point, the risotto should be thickening nicely. You may need to stir it a bit more frequently now. Add the nutritional yeast, and more broth if necessary. After 60 minutes of simmering, check tenderness of the grain, it should be chewy, but tender. If it’s close to ready, add the asparagus and peas. Maintain a gentle simmer for 10-15 more minutes. When vegetables are tender and cooked through, remove from heat and stir in the grated Parmesean cheese. Season to taste with salt and pepper. *Ingredient variations are pretty much endless. 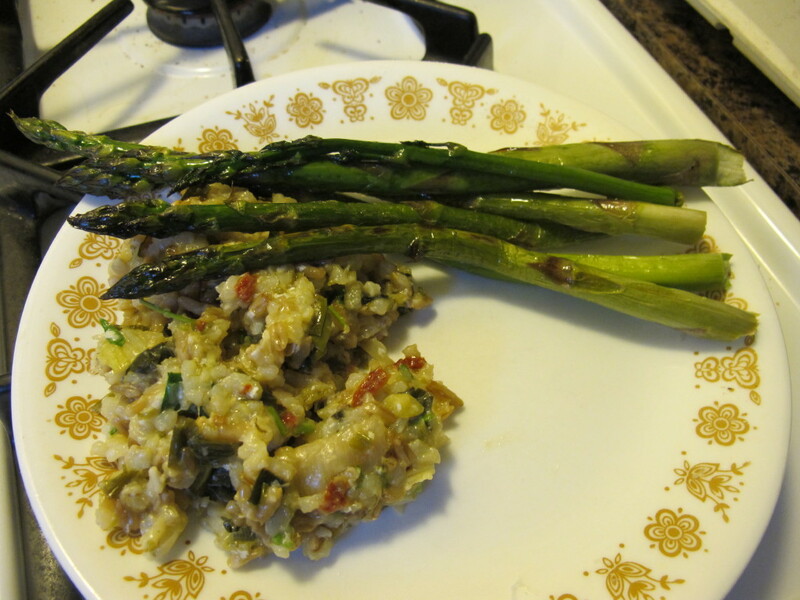 The picture above is actually a sun-dried tomato and leek [oat groat] risotto, originally mentioned here. This entry was posted in Food, Recipes and tagged cooking, eat local, vegetarian recipes. Bookmark the permalink. This looks amazing, thank you! Looks yummy! I’ve always wondered what the heck risotto was! Yum!!! I wish I was there to enjoy!!! Reblogged this on Julia Homeopath.